‘Be still’ is one of my favorite hymns. Click here to listen and read the words at the same time. And perhaps do it again after you’re read this. My weeks were once full of work. And more work. On the train in the morning I prayed for strength to get me through the day and then raced off from there without another thought for God. And at the end of the day or week I would give thanks. But thanks for what? For barely getting me to the finishing line? For just about keeping my head above water? The workplace is a roller coaster ride. Once we’re on it we can’t slow it down or get off. But how about we plan before we get on it? Before we accept all of those meetings, client dinners and conferences. On top of that there’s the other work. The parent meetings, church meetings, mission trips, prayer meetings, the list goes on. God isn’t keeping track of all the things we do but he might be keeping track of why we do it and for what purpose. In His name or ours? Doing less, with prayer and a listening ear, may mean doing more for God. With him in our hearts always. You might also have time to take in the world around you. I’ve just realized that this is practically the same post as last week’s STOP, LOOK, LISTEN, THINK! Oh well, perhaps it just needed to be said again? The title for today’s post was a slogan for teaching young children road safety when I was a child. Click here to watch it. Try not to laugh because It was very effective. I have a feeling that it could also be an effective slogan for adults in how we communicate with God. As a freelancer it’s very tempting to always be searching for work and not spending my time meditating on God’s word. The answer for getting work isn’t necessarily found by firing off a million emails randomly but it can be found in scripture. The scripture above is a good example. Does the work I’m looking for allow me to also spend time doing God’s work? Does the opportunity allow me to pay testimony to Him in some way? Or is it just about the money? Does the work let me use my skills (skills I’m blessed with) in ways that God would want me to use them? Answers to questions like these dictate what I pray for. Prayers for God’s glory and not my own. That’s something to stop, look, listen and think about! Heavenly Father, forgive us for not seeking your guidance when we look for opportunities. May our will reflect yours in all that we do, Amen! What do you have in common with God? Getting to know God means having a relationship with him and not just believing in Him. I’m sure God has everything in common with us but, as human beings. it’s probably good to find something that allows you to see God or something that sparks up a conversation with Him. Perhaps your work is that? I think it is definitely mine. I’m blessed to have my work evolve around creation, light, form and beauty. All of which has come from God. When I see something I like, I try to credit and think of God. And thank him. When I have an idea (good or bad) I know it’s from God. But it’s really just a conversation starter for me. A reminder that He exists and is everywhere. And like any relationship, it grows stronger as you find more things to talk about and more in common. You may become more open to Him. So, God wants to connect with you! He has similar interests! Heavenly Father, we know you long to have a relationship with us, we pray we can seek you and realize that you want us to talk to you about everything we do, like children do. Help us find those conversation starters – Amen! Can we ever be as ambitious as God? Can our personal ambitions ever be as ambitious as those that God has for us? I think we sometimes have an image of God as someone who’s ‘been there and done that’. An old guy with long white flowing hair and beard from the ‘old times’. Not someone we can relate to. But He is not separate from us. The Holy Spirit dwells in us (when asked for through prayer) so He is in us. However, if He is not then any ambition we have might be fruitless because its not of Him and maybe not that ambitious at all! Spending 5 years working toward a promotion may seem like a huge ambition, and there’s nothing wrong with working hard to get there but with God’s guidance who knows what ambitious plans he has instead? And that’s the thing. Not knowing. It’s the hardest part because God only lights the path a few steps in front of us, the rest is based on our faith. But when we take into our own hands we have the full beam on. 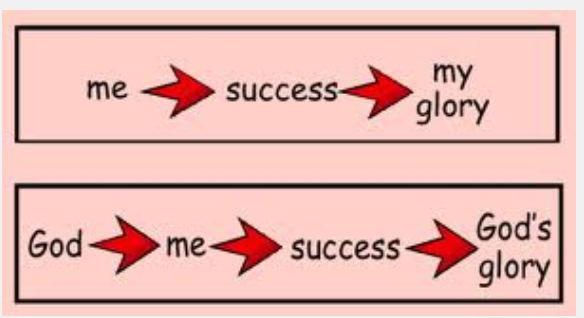 The path clearly lit all the way to the destination where the word SUCCESS! is brightly lit with fireworks going off around it! At least that’s what we see. It may well end spelling something different if it’s not on God’s path. I’m not suggesting it will be a path to destruction. It may well be fine but perhaps an uphill struggle? Against the wind? A feeling that you’re fighting against something? We’ve all felt that. The times that I’ve switched the full beam off it’s felt easier. More freedom with the wind behind me. It can start with a prayer. A simple request to God to guide us in our work and careers, to make the right choices and have the right ambitions. To glorify Him. Then it’s all in his hands. It’s so much easier when you let someone else do the work! ‘For God, who said, “Let light shine out of darkness,” made his light shine in our hearts to give us the light of the knowledge of God’s glory displayed in the face of Christ’. The phrase ‘Rise and Shine’ was brought up by my wife the other day. She was about to say it to our children and then she remembered how much she loathed it when she was a child. I agreed, it is an annoying phrase. It’s the last thing we want to hear but I had to put it as a heading today. There has been a common theme in these posts about Christ shining through us. When I pray what to write about, so often it comes up. But being repetitive isn’t a bad thing. The Bible is full of it. Being able to shine to others through Christ is the single most important thing in the work place. Every word, every facial expression and body language reflects Him. It’s how we overcome anger, jealousy and stress. Praying for peace and strength allows us to shine. Shine Jesus Shine, Fill this land with the Father’s glory. Blaze spirit blaze, set our hearts on fire. Flow, river flow, Flood the nations with grace and mercy. Send forth your word Lord and let there be light. It’s a shame you can’t hear the tune but hopefully one day I’ll be able to embed songs into the blog. If you have time, look it up! Heavenly Father, As your humble servants we ask for you to shine through us to the world and as the lyrics of the song go ‘Set out hearts on fire’ – Amen! What if you could only live until you were 70? I know this sounds like a depressing verse and I agree it is, if looked at from a human point of view. But it’s actually quite liberating. Especially if you’re 47 years old like me. It means I have 23 years left to focus on the things that God wants me to do. ( I may live until I’m 90 but play along with me). How do I know what God wants me to do? I don’t really. But I know some things. God made me and blessed me with some skills. In my case, my skills evolve around creativity. I have used the last 27 years of those skills dedicated to working for Advertising agencies and providing for my family. Nothing wrong with that. But I haven’t necessarily used them to give back to God. To serve him. So, now I recognize that, all I can do is pray and listen to what God has for me to do. I know that if I’ve offered myself up to him, something will come up. Most likely something that I never thought I would do. Like write a blog! Heavenly Father, you have blessed us with so many gifts, Our families, our homes and our jobs. Help us to realize that they’re only temporary gifts from you and that you want us to use them to glorify you. We offer ourselves up to you Lord. Amen!